Home Expert Advice Skincare Advice Myths Can Jade Rollers Really Help Skin? Jade rollers are having a moment in the world of skin care, but do they really work? Let’s delve into what jade rollers are and what science has to say about their alleged benefits. 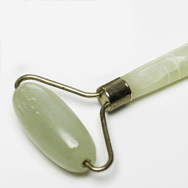 A jade roller is a handheld device that holds a smooth stone (it may or may not be real jade, as we explain below) that allows you to easily roll the cool-feeling stone over your skin. As the story goes, the early versions of these rollers first appeared as part of ancient Chinese beauty rituals, supposedly for their metaphysical benefits and healing energy. Fast-forward to the 21st century: jade rollers have been commercialized into a skin care fad and touted as a remedy for just about every skin concern under the sun. As mentioned, not all jade rollers are made from authentic jade. Faux look-alike jade knockoffs can be created by dyeing and treating marble, quartz, and other stones. While that’s somewhat deceitful, from a benefits perspective it’s not the end of the world, considering that jade itself does not have any special properties for skin. What Skin Benefits Do Jade Rollers Offer? Regardless of the type of rock used, the companies selling jade rollers claim that they’ll treat everything, from puffiness and dark circles to fine lines and wrinkles. Some make “face-slimming” claims; others claim that jade rollers help detoxify skin, which isn't physiologically possible. Many of these claims are attributed to the tool’s massaging action which supposedly helps improve lymphatic drainage and circulation. Here’s the kicker: Most people don’t have ongoing lymphatic issues in their facial skin, and even if they did, there’s no proof that facial massage of this kind can help. But even if it did help, any benefit would be temporary. More to the point, massaging skin can actually overstimulate circulation, exacerbating such issues as sensitive skin, rosacea, or broken capillaries. As for the claims that jade rollers can minimize dark circles and wrinkles—jade rollers are zero help because they don’t address either issue’s underlying causes. See our individual articles based on peer-reviewed, published research for what really works for dark circles and wrinkles. Best-case scenario: The most likely benefit you can expect from a jade roller is a reduction in under-eye puffiness… if the puffiness results from fluid retention rather than from other common causes. We suggest using the small end of the jade roller with a very light touch to gently massage the puffy area and help relieve swelling. Note: If you can see your skin move, that means you’re being too aggressive with the roller. That’s a deal-breaker because it means you’re pulling and tugging at skin’s elastin, which can lead to sagging. Can Jade Rollers Help Skin Care Products Absorb Better? Last, but not least, you may have heard that jade rollers can help “push” ingredients into your skin so they absorb better. The truth? There’s nothing about a jade roller that can help your skin care products penetrate any better than applying them with your fingers. How come? The answer comes down to chemistry: Absorption is all about the molecular size of the ingredients in the products you’re using. Some ingredients, like antioxidants, are needed on skin’s surface to interrupt environmental assault before it affects your skin; other ingredients, like peptides and retinol, must be absorbed more deeply to work their magic. A well-formulated product contains some ingredients that remain on the surface and some that penetrate more deeply; no special application method is needed. We admit, jade rollers can feel nice—even refreshing—on skin. If you use them gently and enjoy the experience, they can be a welcome addition to self-care. What’s certain is that jade rollers aren’t necessary to get the skin you want, and as with many areas of skin care, keeping your expectations realistic is important.